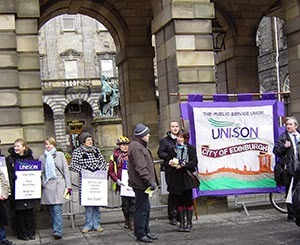 UNISON, the biggest union representing workers at The City of Edinburgh Council, has issued a statement announcing “grave concerns” about service cuts highlighted in the draft budget proposals produced by the council. “While we have some sympathy for the cuts being forced on the council by Westminster and Holyrood, our members have grave concerns that the proposals would see a scathing reduction in all the essential services the council provides, and as a result will affect every Edinburgh resident”, said Tom Connolly, UNISON City of Edinburgh Branch service conditions officer. “UNISON believes that all services provided by the council are vital public services”, says the statement. “These services have been hacked away at year on year. No-one believes that further cuts can be made without destroying front line services. Our fear is that we will lose services that will never return. “We have to challenge the ‘big lie’ that the country is broke. It is not. It is just that the money is in the wrong places. We are not all in this together and it is the people who rely on council services and the people who deliver them that are suffering. “Those services are delivered by people and relied on by people, often the most vulnerable in our city. Instead of cuts, what is needed is greater investment in public services that will not only meet the needs of Edinburgh’s children, the elderly and the disabled, it will also stimulate the local economy and boost jobs in every sector. “Increasing investment also enables the council to employ more staff who in turn is able to spend their incomes back into the local community. “UNISON will ensure that there is a wide consultation with its members and those in sister unions and provide feedback to councillors. “UNISON would encourage all Community Groups, Tenants Association etc, and all service users to contribute to the budget consultation. It is vital that everyone makes their views known to the elected members.